prospecting for myth with digammas and dynamite. give up their gold as one. steered by her husband with a soldier’s sea–mazed eyes. a loom–brown woman, the lines of her mouth warp and weft. as the beloved profile beneath a draping shroud. to the guards at the site. for the tangible, not the true. Sonya Taaffe’s short fiction and poetry can be found in the collections Postcards from the Province of Hyphens (Prime Books), Singing Innocence and Experience (Prime Books), and A Mayse–Bikhl (Papaveria Press), and in anthologies including Aliens: Recent Encounters, Beyond Binary: Genderqueer and Sexually Fluid Speculative Fiction, The Moment of Change: An Anthology of Feminist Speculative Poetry, People of the Book: A Decade of Jewish Science Fiction & Fantasy, The Year’s Best Fantasy and Horror, The Alchemy of Stars: Rhysling Award Winners Showcase, and The Best of Not One of Us. 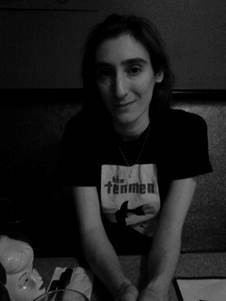 She is currently senior poetry editor at Strange Horizons; she holds master’s degrees in Classics from Brandeis and Yale and once named a Kuiper belt object. She lives in Somerville with her husband and two cats.